Bingham Canyon mine overlook, June 2016. View to the northeast from the top of the Oquirrh Mountains. The mine spans 2.75 miles from the pit wall below the overlook to the farthest visible edge of the mine. The vertical distance from the pit’s bottom to rim is roughly 3,650 feet, which is more than double the height of One World Trade Center, the tallest building in the Western Hemisphere. 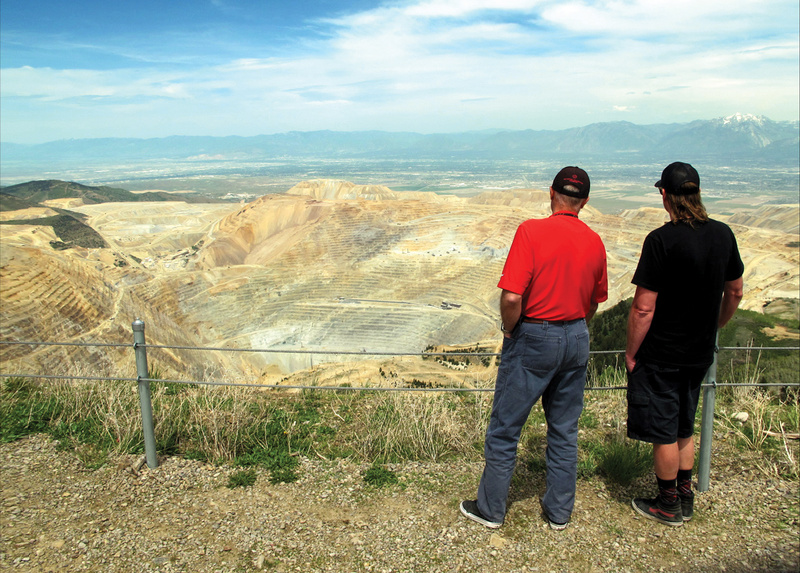 Although Kennecott Utah Copper’s (KUC) Bingham Canyon mine visitor center is closed until further notice, the public can still view the world’s deepest open-pit mine from a lesser known, unstaffed overlook atop the Oquirrh Mountains. The Bingham Canyon mine visitor center was one of Salt Lake County’s busiest tourist attractions, hosting over 3 million visitors in its 20 years of seasonal operation from 1992 to 2012. 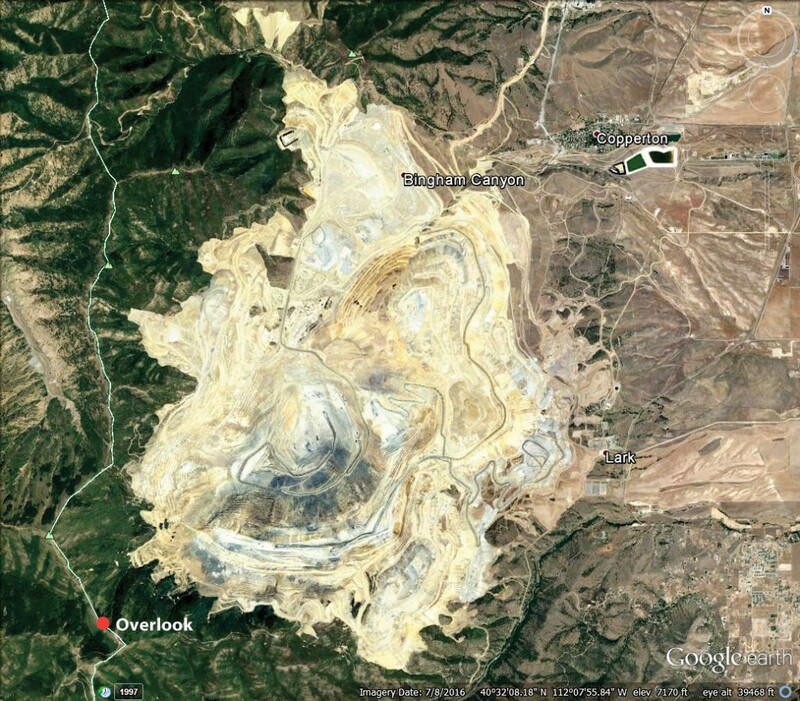 On April 10, 2013, before its scheduled annual re-opening, two massive landslides carrying about 145 million tons of rock scoured away the visitor center’s building pads, overlook, and parking lot (for more information, see “Bingham Canyon’s Manefay Landslides and the Future of the Mine” in Survey Notes, v. 48, no. 3). Although this was the largest mining-induced landslide in history, causing lost production and hundreds of millions of dollars of damage, it resulted in no injury or loss of life. KUC used sophisticated monitoring of the pit walls to predict the slide and move personnel and some equipment, including the visitor center’s portable buildings, out of harm’s way. With the indefinite closure of the visitor center, KUC has offered a virtual online tour as a substitute (http://www.kennecott.com/virtual-tour). However, the enormity of the mine is something that one must see in person to fully appreciate. The geology of the Bingham mine orebody is complex. In simplified terms, about 30 to 40 million years ago magma was injected into a sequence of predominantly quartzite and limestone beds that are part of the roughly 300- to 350-million-year-old Oquirrh Group. The magma cooled to form a body of igneous rock (monzonite porphyry) known as the Bingham stock. Hot fluids generated from this magma deposited various copper-sulfide (mainly chalcopyrite) and other metallic minerals, forming a large low-grade orebody. 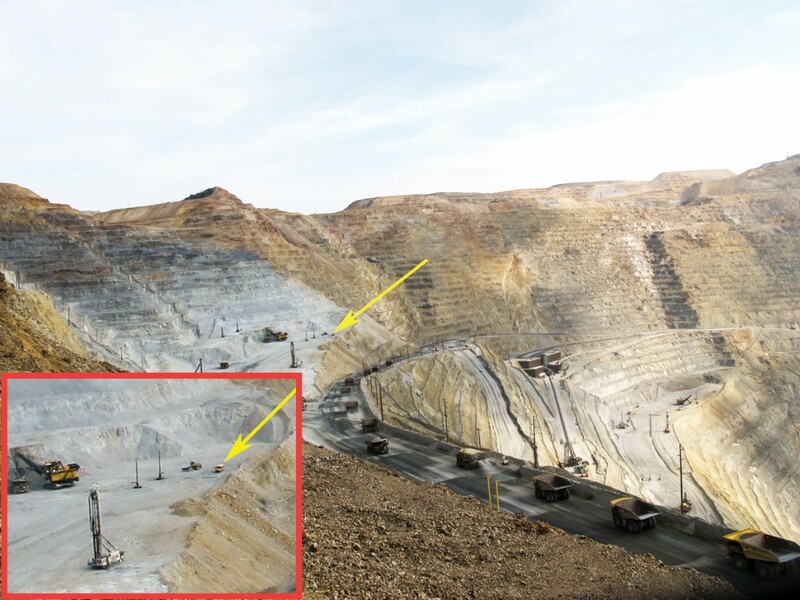 KUC’s Bingham Canyon mine is one of the largest and most efficient mines in the world. It has produced more copper than any other district in the U.S., accounting for over 16% of total U.S. copper production. In addition to copper, the mine produces gold, molybdenum, and silver. KUC’s combined annual value of these metals peaked in 2011 at $2.9 billion. The mine owes its success to economies of scale. The ore is low grade, producing about 10.6 pounds of copper per ton of ore, but a massive amount of it is mined. Furthermore, for every ton of ore, about two tons of overburden must be removed. Mining in Bingham Canyon began in the late 1880s with small underground mines that targeted high-grade ore.
Mining activities remained relatively limited until 1906 when the district became the first in the world to begin large-scale (for the time) open-pit copper mining (for more mine history, see “Race to Ore: The Beginnings of Open-Pit Copper Mining—A Century of Open-Pit Mining at Bingham Canyon” in Survey Notes, v. 39, no. 2). The mine still has about 700 million tons of ore in place. Mining this ore will take about 11 years, push the south wall of the pit out about 1,000 feet, and deepen the pit by about 300 feet. Dependent on external factors such as metal prices, 2028 could be the end of 121 years of open-pit mining at Bingham Canyon. 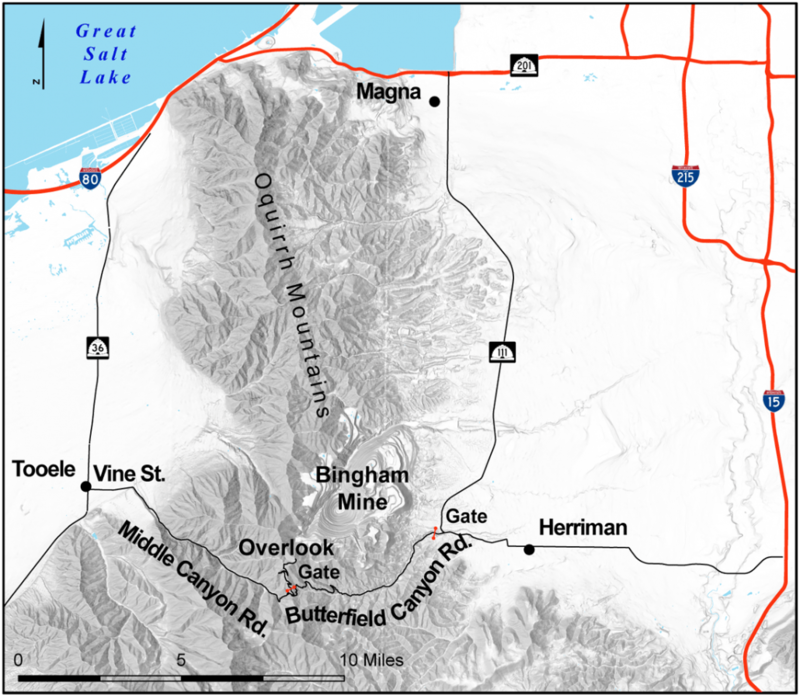 How to get to Bingham Canyon Mine Overlook. The overlook is near the crest of the Oquirrh Mountains, southwest of the pit, and can be accessed seasonally from both Salt Lake and Tooele Valleys. Both routes are generally open from approximately June 1st to November 1st depending on snow pack and weather conditions. For more information on road conditions and closures, contact Salt Lake County Public Works (www.slco.org/operations) or the Tooele County Road Department, (www.co.tooele.ut.us/roads.htm). From Salt Lake Valley: Take I-15 to Draper City, then take exit 291 for UT-71/12300 South and head west. After about a mile, 12300 South jogs to the left and becomes 12600 South, continue west. After 6.4 miles from I-15, turn left onto Main Street in Herriman. Main Street has several bends before becoming Herriman Highway, continue west. After 11 miles from I-15, immediately before the road curves to the right, continue straight ahead onto the unsigned Butterfield Canyon Road. Continue up Butterfield Canyon Road for 7 additional miles until the pavement ends at the ridgeline and turn right onto the unsigned “copper pit overlook road.” The 2.5-mile-long road ends at the overlook. This section of road is unpaved and can be rough and rutted, but is generally passable in a passenger car with reasonable ground clearance. *Note that GPS and online mapping services may route you through Tooele, a much longer route from the Wasatch Front. This is likely due to the programs defaulting to Butterfield Canyon Road being closed for the winter, regardless of the season. From Tooele Valley: Take Main Street (UT-36) in Tooele City to Vine Street and head east on Vine. After about 1.3 miles, Vine curves to the right and becomes Middle Canyon Road. Continue up Middle Canyon Road for a total of 8.2 miles from Main Street and turn left onto the unsigned “copper pit overlook road.” See paragraph above for details.